BAIKONUR (Kazakhstan) • The search for life on Mars has entered a new era with two robotic spacecraft blasting off on a Russian rocket from the Baikonur cosmodrome in Kazakhstan as part of a European-Russian unmanned space mission to sniff out out waste gases released by alien organisms on the Red Planet. The craft, part of the ExoMars programme, lifted off yesterday, starting a seven-month journey through space that could bring humans a step closer to flying to Mars. With its suite of high-tech instruments, the Trace Gas Orbiter (TGO) is expected to arrive at Mars in October after a journey of 496 million km. 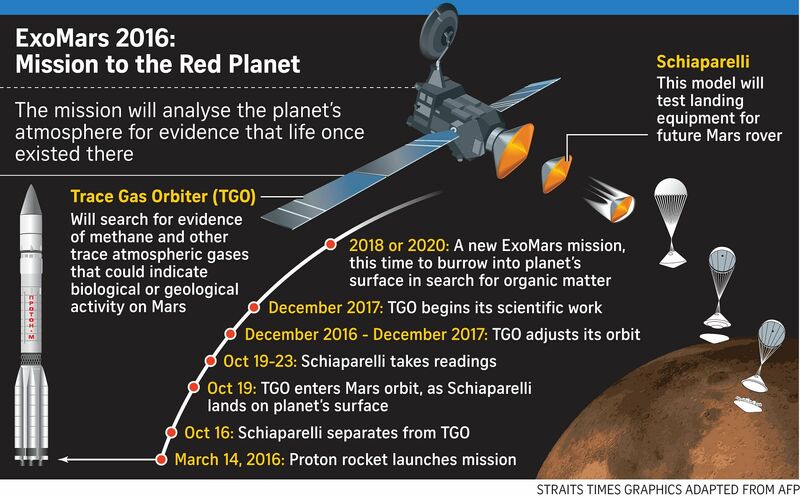 TGO will photograph the Red Planet and analyse its air, splitting off from a Mars lander dubbed Schiaparelli days before entering its atmosphere. It carries an atmospheric probe that is to study trace gases such as methane - a chemical that on Earth is strongly tied to life - that previous Mars missions have detected in the planet's atmosphere. Maybe, maybe we can find out if there's life extant on the Red Planet. PROFESSOR MARK MCCAUGHREAN, senior science adviser at the European Space Agency . "TGO will be like a big nose in space," said ExoMars project scientist Jorge Vago. The probe will measure minute levels of atmospheric gases, among which may be the natural waste products of microbial Martians. The European Space Agency (ESA) said that methane is normally destroyed by ultraviolet radiation within a few hundred years, which implied that in Mars' case, "it must still be produced today". The presence of methane gas on Mars could come from life on, or under, the surface, but since the gas is also released by chemical reactions in rocks, scientists cannot be sure of its source. "Maybe, maybe we can find out if there's life extant on the Red Planet," Professor Mark McCaughrean, senior science adviser at the ESA, told Britain's The Guardian. One component of TGO, a neuron detector called Frend, can help provide improved mapping of water distribution on Mars, amid growing evidence the planet once had as much, if not more, water than Earth. A better understanding of water on Mars, which is the fourth planet from the Sun, could aid scientists' understanding of how the Earth might cope in conditions of increased drought. Schiaparelli will spend several days measuring climatic conditions including seasonal dust storms and test technologies needed for a rover due to follow in 2018. The module takes its name from 19th century Italian astronomer Giovanni Schiaparelli whose discovery of "canals" on Mars caused people to believe, for a while, that there was intelligent life on our neighbouring planet. As for the next phase of ExoMars, ESA director-general Jan Woerner has mooted a possible two-year delay, saying in January: "We need some more money" due to cost increases. The director of human spaceflight at ESA, Mr Thomas Reiter, said ahead of the launch that he believed a manned mission to Mars would take place "maybe in 20 years or 30 years".